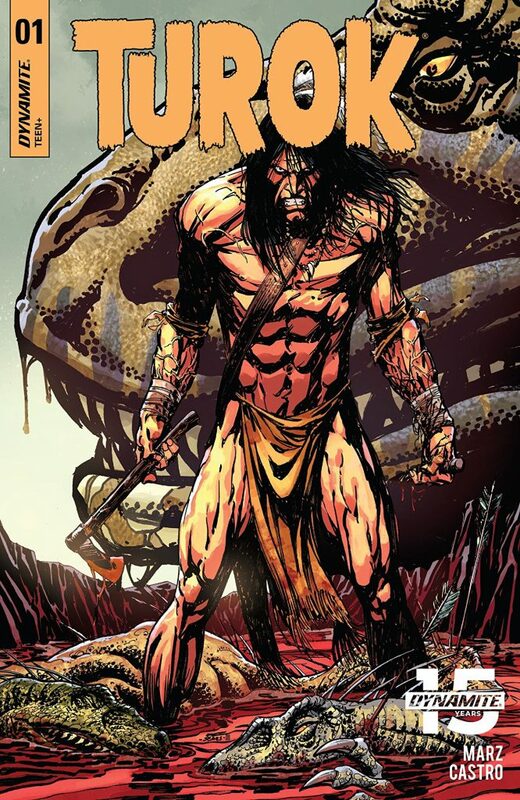 Pullbox Reviews Turok #1-The Son of Stone Returns! A new hero rises! 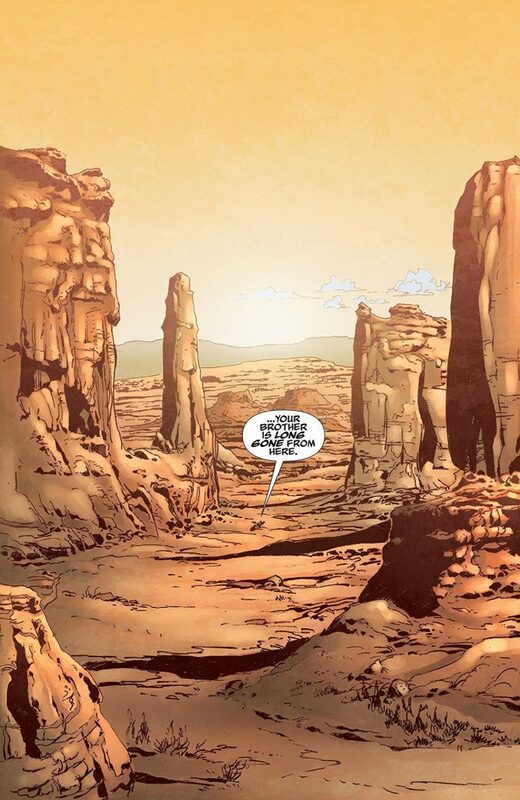 Turok pursues his kidnapped brother… in the Badlands of the Old West! In the waning days of the Indian Wars, the U.S. cavalry has captured Andar, but Turok will stop at nothing to rescue him. But that quest will lead Turok, Andar and even the soldiers to a strange, lost land inhabited by creatures beyond their imaginations. This is Turok as you’ve never seen him before … and Turok as you’ve always seen him! Written by acclaimed storyteller Ron Marz (Green Lantern, Silver Surfer, Witchblade), with exquisite art by Roberto Castro (Red Sojna, Flash Gordon). 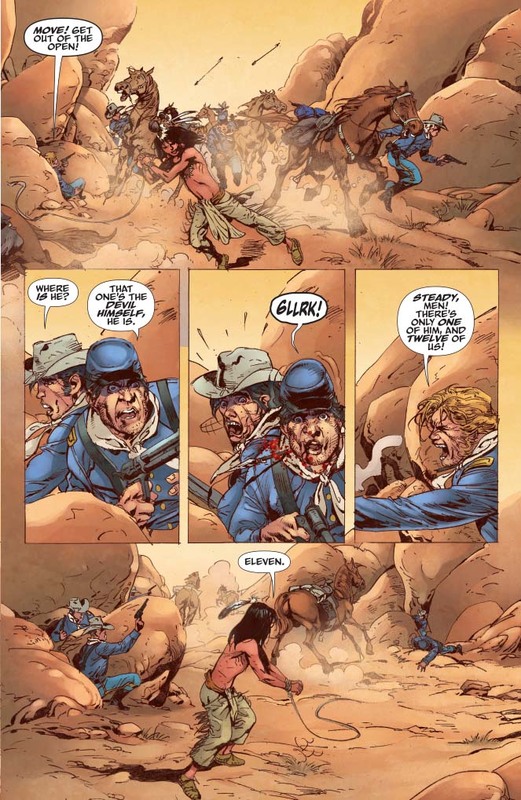 In the 1870’s, Turok and his young brother Andar have run afoul of the U.S. Army for the grave offense of refusing to be relocated to a reservation. On the run, the brothers discover the most incredible thing, equal parts salvation from their pursuers and portal to unimaginable dangers. What they’ve found is the doorway to a veritable land that time forgot. Will young Andar and fierce Turok remain the hunted, or are they destined to become… Hunters? When I was a kid, I had a big stack of the old Gold Key comics. They were read, re-read, and read again, to the point that they’d become just a bunch of loose pages with a tattered cover folded together. I was reading Magnus: Robot Fighter, Solar: Man of the Atom, Lost in Space, and Turok: Son of Stone. That last one was my personal favorite, embracing the best elements of fantasy and the Western… and it had dinosaurs! It was a pretty major influence on my young mind, and put a totally different spin on things when the neighborhood kids played cowboys and Indians (guess who the good guys were…?). A while back, I read all of the rebooted Gold Key classics that Dynamite put out into the world. While I thought they were good (the new spin on Magnus was outstanding), their update to my childhood favorite- Turok- just didn’t hit the cord with me. I don’t know if it was too far a departure from the original stories, taking place in a post-apocalyptic world rather than the classic Western setting. I do know that while it was good, I just didn’t think it was “great”. Along comes this new iteration of the old Son of Stone, taking up the challenge of returning to its roots. Writer Ron Marz has put together an adventure story set in the days of yesteryear, restoring heroic brothers Turok and Andar to their former glory. 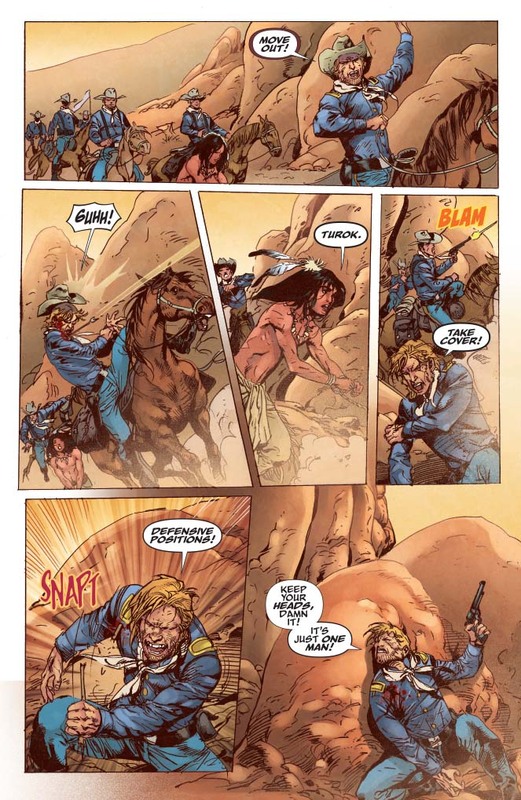 The opening issue is all about the action as Turok stalks the unit of Calvary soldiers, led by tough-as-nails Captain Connors, who have taken Andar into custody. Marz does a great job of letting the action tell the story, using dialogue only where it’s needed rather than trying to bog the page down with exposition. Roberto Castro’s illustrations are sharp and dynamic, with a great eye to the flow of that action. He uses a lot of overlapping panel arrangements rather than sharply divided borders to move the reader’s eye along. On some of the larger panels, Castro also did a good job of showing the open landscape, all barren stretches and towering mesas. Rounding out the visual appeal of the book, the colors by Salvatore Aiala caught the right tone. His grasp of the genre and setting is apparent in the way he catches the dusty landscape and glaring sun. Finally, the lettering put in by Troy Peteri (of A Different World Studios) keeps things moving along without getting in the way of the illustrations. The story is presented in a clear, plain text, with little flourishes here and there for emphasis. Peteri did his job so well that while I was reading, I could hear the dialogue being voiced in my head, complete with muttered curses and exclamations of pain and outrage. This new Turok is a return to what was awesome about the original- and in ’92 (Valiant), ’98 (Acclaim), & 2010 (Dark Horse). I love the Western genre, and missed that in Dynamite’s last swing at the title. That’s not an issue anymore. As I turned the pages of this opening issue, my brain inserted its own Sergio Leonne inspired soundtrack, and at one point I could have sworn that I saw a tumbleweed rolling along out of the corner of my eye.